Well what can I say but things don’t always move fast in tech world, Google’s long awaited file storing system Google Drive has finally parked up and is ready to use (I am right now!). so here are some facts about the service. With Drive you get 5GB free storage but let’s face it most people that use the service will need more space so for an update to 25GB you pay £1.54 ($2.49) a month and for extreme users you can get 100GB for £3.08 ($4.99) a month and for big businesses you can get 1TB for £30.80 ($49.99) a month. 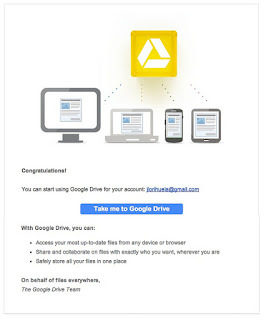 Drive fits like a glove into google’s already bulging stable of products and works seamlessly with Gmail and Google+ being able to share photos via drive to either service. Now you can store and view your files offline as well. 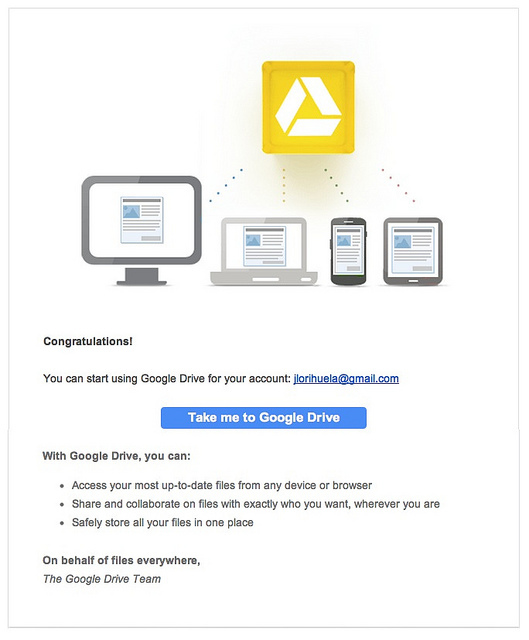 Google Drive allows live multi author updating meaning a group of people from different parts of the world can work on a research document in live time and changes will be automatically synced to the desktop file of every user with the ability for them to leave comments I.e reasons why their research findings have changed and a notification will be sent to everyone about the change. Google has massive hopes for the cloud as I written about last year. I don’t see Google pushing to open up files on Drive to non users or at least if they did it would be of a token read only functionality. Google will use Drive as a backend product for users to store photos, videos, word documents and audio files on the cloud. I personally hope to see more integration with Blogger, Feedburner and maybe even Youtube but mainly feedburner as then their Blogger service can fully compete with Wordpress as you would be able to store your bands music or companies podcasts on the service. With Drive as the host and add a timed release function to simultaneously upload to iTunes and your website at the same time and add the new episode to the Google Listen directory amongst others providers, while sending out an update on social media (like you can do with new blog posts) to tell everyone that it’s up. Both services are available on mobile phones Google on Android with and iPhone/iPad version coming soon but Microsoft are ahead with a windows phone version and iPhone/iPad version already available. Both have desktop/offline capabilities. I think Microsoft are the early leaders with more free space, being able to have more in place with phone apps, is a cheaper service and non skydrive members can have access to files however I believe Google drive offers more longevity with the ability to multi author documents, Google having a much bigger share of Cloud storage and what the future may hold with the possibility of great fluidity between Drive, Feedburner and Blogger. Things have just got interesting! Will you be storing more on the cloud? Do you use any existing services? Have you given the service a test “Drive” yet?